I haven’t tried heating flour in a conventional oven (yet! ), but I have read about it. In relation to pancake springiness, heat-treatment at 120 degrees C for 2 hours in an oven has been shown to have the same improving effect as chlorination (Seguchi, 1990). Interestingly, incubation of starch granules at room temperature for 233 days also has the same effects on the starch granule’s oil-binding capacity (Seguchi, 1993). However, more recent scientific analysis suggests a different mechanism of starch gelatinisation when the granules are heated in a microwave compared to conduction heating (Palav & Seetharaman, 2006). Microwave heating (but not conduction heating) results in granule rupture, which in turn has an effect on the rheological behaviour of the dough or batter. Lauren then asked about how to avoid the ‘toasted’ taste when microwaving flour, which is something I have also been thinking about for some time now. Chocolate cakes are one way of masking the flavour (and they always find an appreciative audience among my children), but it would be lovely to be able to solve the ‘colour or crumb‘ conundrum. It’s funny how the majority of my flour experiments took place whilst builders were working intensively on our home last year. Perhaps the arrival of our plumber this morning acted subconsciously as the final call-to-action today. Whatever the spur, it wasn’t long before 10 oz of soft 00 grade flour was in the oven at 120 degrees C for 2 hours! From some distant reading, I also recalled an invention in which pharmaceutical substances were prepared in a microwave without scorching by means of continual tumbling (if anyone finds a reference for this memory, do let me know – I didn’t bookmark the source when I first came across the information). I wasn’t up for continual tumbling today, but I did wonder if perhaps the toasting problem was a result of too little agitation during heating. Now, I have been known to shout and rant a bit at electrical appliances in the past, but I opted instead to agitate the flour every 10 seconds by opening the microwave door and swirling it quickly with a fork. It took about 10 minutes of microwaving-time (which equates to about 18 minutes of preparation time) before the flour reached 130 degrees C.
Here are my 3 different flour-treatments of today: to 130 degrees C with 1-minute agitation in the microwave (top-left); to 130 degrees C with 10-second agitation in the microwave (right); 2 hours at 120 degrees C in the oven (bottom-left). I then proceeded to bake cakes using the 2 whitest flours: one lazy lie-in from the oven; one greatly-agitated from the microwave. I am excited to report that both flours produced a yellow butter cake without any taste of toasting and far beyond anything that can be achieved without flour-treatment. 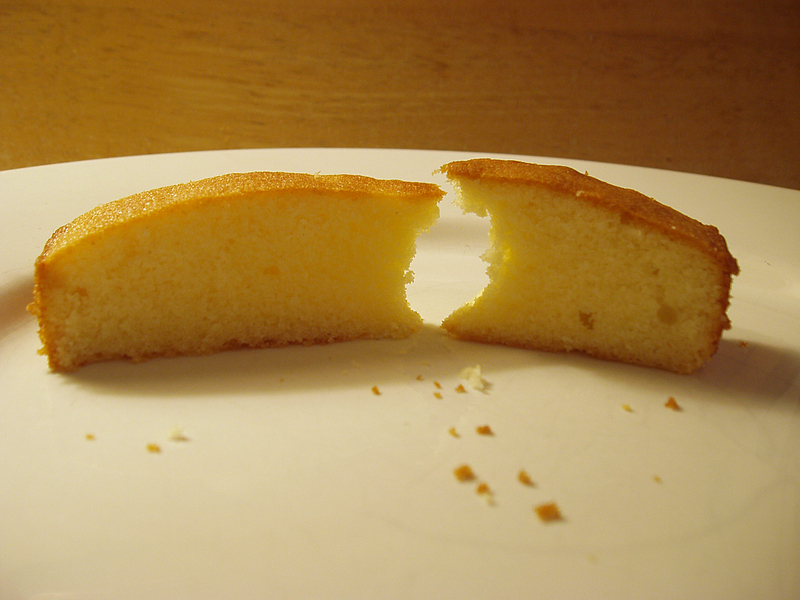 In terms of vital statistics, the microwaved-flour cake rose just over 1 cm higher than the oven-flour cake and had a slightly finer, more delicate crumb. Although today revealed a choice of flour-treatment, for me the ‘battle’ is won by the microwave on two counts: crumb and environment (apparently, the microwave uses about 75% less energy than a conventional electric oven). Thanks for clarifying! I take it you didn’t give your flour a steam treatment, but did you use Xanthan? Again, many thanks for the time and energy you put into experimentation! I didn’t steam the flours, but they did sit around in my kitchen for a while before I had a chance to use them (which is a slower way of allowing them to regain moisture). I used 1/4 tsp of xanthan for each cake. It’s interesting that you note on Rose’s blog that xanthan is now being sold as a cake improver (for regular and not gluten-free baking, I assume)! Very interesting results. I guess I should try the xanthan the next time I microwave my flour. If you try the xanthan, do let me know what you think – you’ve much more experience of US cake flour than I have, so it will be useful to see what difference (if any) you find it makes. I’ve just updated the information on my kate flour page to reflect all the refinements we’ve introduced since I first wrote it. I made another batch of 10-second-stirring flour today and L (my 6 yr old daughter) pronounced the yellow butter cake I made with it to be “the most scrummy cake ever”. The whole butter/vanilla combination comes through so much more clearly now without the toasted effect! Unfortunately though, the McDougall’s Supreme Sponge flour (which is self-raising) still comes out with a brown twang (although without the popcorn taste). I think it’s the leavening in it that toasts (the flour is speckled with tiny brown dots after microwaving). I heated two kilogrammes of flour (Type 405) in the oven at 160 C. for about three hours until the temperature of the flour reached 130 C, then let it cool in the oven over night. 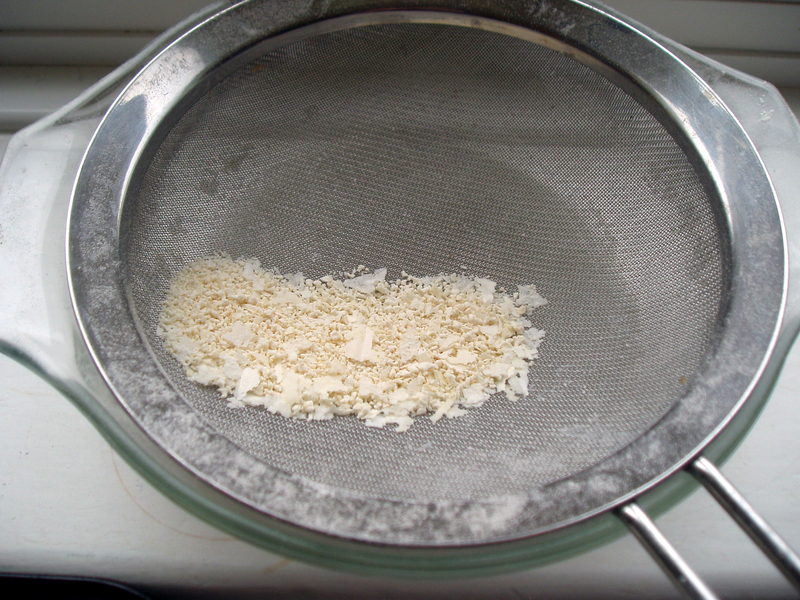 The next morning I sifted it and added corn starch amounting to 15% of its weight. Before baking, I popped 250 grammes of the treated flour in the microwave for 1 minute, stirring twice, then I added 1/4 teaspoon Xanthan gum. I must say that the result of this experiment was superior to the previous attempts at heating the flour solely in the microwave, especially as regards to flavour and the final cake’s texture. The big advantage, as far as I am concerned, is that I can make enough flour for two-three months in one go. I honestly don’t have the time or the patience to sit in front of my microwave for twenty minutes and stir the flour every ten seconds. By the way, great blog. That sounds like a wonderful use of all the results from the various flour trials – thanks for sharing it! 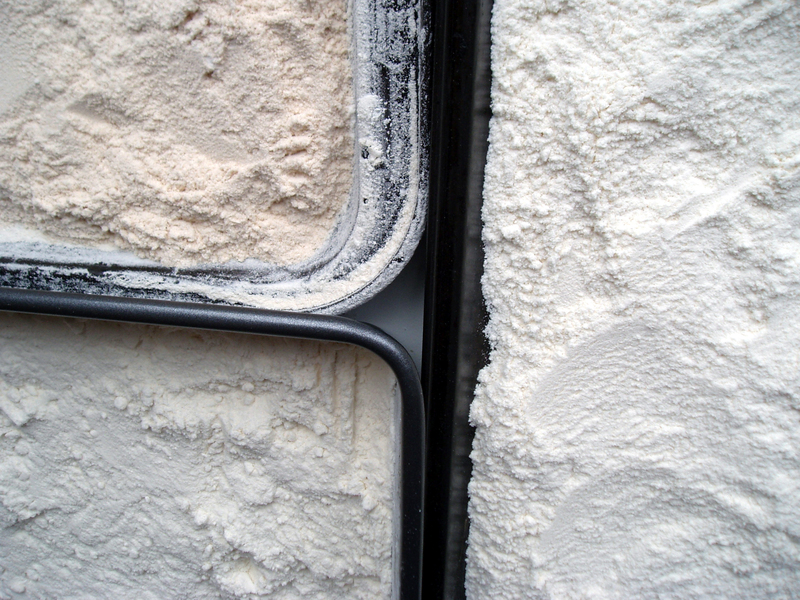 Rose posted a photo of how close we’re getting to the performance of cake flour on her blog: An Early Holiday Present. I’m pleased you’ve found a way to get this improved texture and taste that also fits in with your schedule 🙂 .